Person 2- “OMG!!! You sick bas****!!! Get away from me if you drink that crap! It’s nasty! It’s made from Llama brains! You are no longer a part of my life!! Replace eggnog and drinking with fruitcake and eating and you have the picture of the typical reactions to both eggnog and fruitcake. I stand firmly in the camp of those holding up eggnog/fruitcake trucks. Not….erhmmmmm *whistles innocently* that I’ve ever done that. I adore both eggnog and the much maligned fruitcake. I make my own fruitcake every year (you can get it how you like it that way, which in my case means a ton of fruit) and tend to buy one or two or eight of the preservative filled Hostess or whatever brand I see… “Joes Fruitcake anyone”? fruitcakes. And I happily slurp down a gallon or twelve of store bought eggnog each holiday season. Don’t get me wrong… home made is good too but somehow it just isn’t the same as the overly thick, overly sweet kind from a carton. So when I saw a recipe a while back on Mandys Recipe Box for eggnog coffee cake, I knew I had to try it. I mean… it uses store bought eggnog! But (no offense Mandy) I knew I wanted to change it up a bit. Originally though, it wasn’t going to be a big change, just a matter of more struesel and more spice as well as the chance to use my LorAnn Eggnog Flavoring. But, like I said, that was originally. It ended up being a larger change than I meant to make but it actually all worked out and saved some calories to boot. PLUS, made this egg free for those who like that. How? Simple. I forgot to add the eggs to the batter. Oops. When I saw how thick the batter was, I added about 2 tablespoons more eggnog to thin it out some. It seems to have done the trick in replacing the eggs because this was quite yummy without them. And it was still moist and tender. So, as far as I am concerned, the eggs are optional. Next time I make it, I’ll add the eggs out of curiosity but that’s about it lol. Sooooo… if you like eggnog and warm from the oven baked goods, try this. It has a nice eggnog flavor and a moist tender crumb (even without the eggs hehe). Good cake for a weekend breakfast or a simple dessert. This comes together quickly. The original recipe called for an 8 hour rest time but I skipped that and it was fine. That would however be handy if you wanted to mix it up the night before and just pour and bake the next morning. Grease bottom of a 13×9 inch pan and preheat oven to 350 degrees. In a small bowl, mix together your struesel ingredients and set aside. In a large bowl, beat together your butter and sugar until creamy. Add in the eggnog, sour cream , extracts and eggs (if using). On low speed, beat in the flour, baking powder, baking soda and salt. Spread the batter in the prepared pan. At this point you can refrigerate for 8 or more hours, but like I said, I didn’t. Bake at 350 degrees for about 35 minutes or until a skewer inserted in the middle comes out clean. Let cake cool in pan on a wire rack. 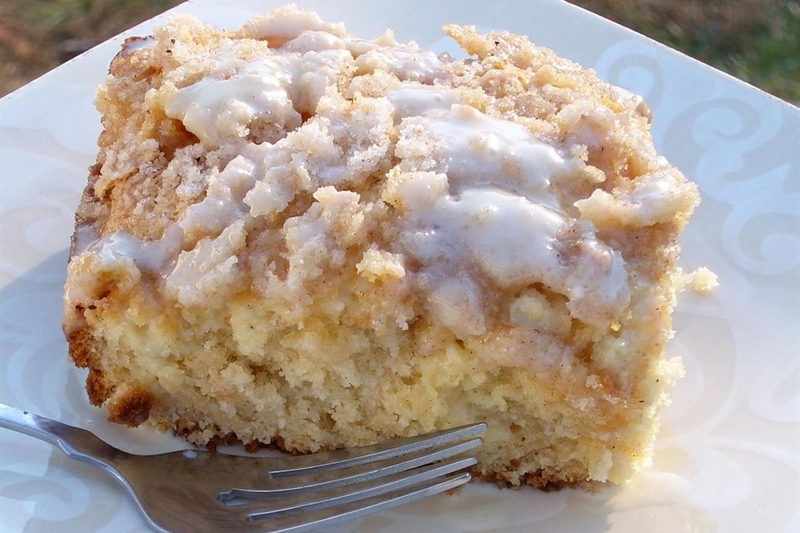 Mix together your glaze ingredients and eat a spoonful of it and drizzle all over the coffeecake. This entry was posted in Breakfast, Easy, Holiday Foods, Quick Breads and tagged coffeecake, easy, Eggnog, quick breads by Janet. Bookmark the permalink. This sounds really good. I can’t wait to try it!